This narrative is based on the work of Mr. Isaac S. H. Jones and the Session minutes. it is impossible to detail the events of a hundred years in a brief and readily readable document. Therefore, I have selected portions of the early history of the church as the main portion, to allow present-day readers to share in the history and traditions that bind us together as Christians and members of the Eddington Presbyterian Church. The events – then and now – are presented in chronological order to preserve the sense of history. For some years, there are no entries. The reader should not be concerned, however, for these were years when the church and its congregation was going about the routines of worshipping, fellowshipping, serving the community, maintaining the church properties, and all those day-to-day activities that are taken for granted and are responsible for keeping the church at Eddington going for a hundred years. At some risk, I have included some names of those of God’s servants responsible for some of the more dramatic events in our Church’s life. It is impossible to include (or to really know) the names of all those in former and modern times who worked and are working for our Lord here in Eddington. If your name or one of your ancestors is not included in this chronicle, be comforted that God’s records are complete, and His reward and praise are what we seek. 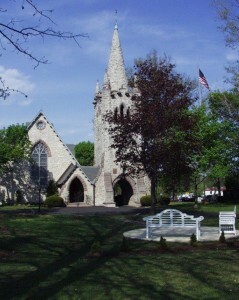 The Eddington Presbyterian Church derives its existence from the “mother” church – The Bensalem Presbyterian Church. We are thankful that the Rev. William Tennent, Jr. chose this portion of God’s vineyard in which to labor, and from his labors to have established the Bensalem church from which “we grew”. 1844 ~ The Bristol Presbyterian church was founded to serve the families around the growing port of Bristol, Pennsylvania. The growth of popluation along the Delaware River, and the King’s Highway (also known as the Frankford to Bristol Pike) gradually drew members from the Bensalem church. 1861 ~ The Aurora Presbyterian chapel was establsihed to serve the Presbyterian population in the Eddington, Cornwells Heights and Andalusia areas. The name “Aurora” was taken from the Aurora Wharf in the vicinity. The chapel, under the direction of “Mother church” Bensalem, was a frame building approzimately on the site of the old synthetic rubber plant on State Road. Sunday school ws regularly held and occasional preaching services were scheduled. 1866 ~ It developed that the Aurora Chapel was an inconvenient location to serve the needs for Lower Bensalem Township. The building was abandoned and services were held in the Eddington Public school building. Sunday school attendance at this time was 25 girls and 23 boys. 1872 ~ The Bridgewater Presbyterian Chapel was established by Dr. Michael Burdett who became the pastor of Bensalem Presbyterian at age 67. The Aurora chapel was dismanted and the matereal used to build the one room Bridgewater Chapel on a plot of ground in Bridgewater between Bristol Pike and the railroad – possibly in the vicinity of our present church. Dr. Joseph E. Schenck who gave the ground also provided additional lumber from his sawmill on the Neshaminy Creek. 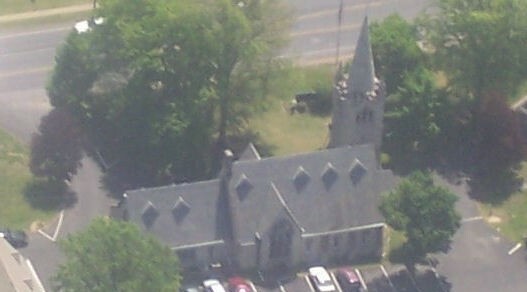 The chapel remained under the direction of the Bensalem Presbyterian Church, sharing the pastor and Session.